The mythical hydra's heads aren't the only thing growing wildly in the depths of the jungle, however. Today, we explore some of the verdant villains featured in the set, sure to seal player characters' floral fates. That's right�plant monsters! 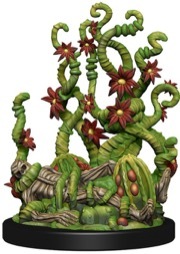 Among the most iconic plant creatures in the game, and the bane of low-level adventurers everywhere is the well camouflaged Murder Vine. All too often unsuspecting explorers stumble across the remains of their predecessors, their treasures still intact, while hacking through the dense foliage of a forest or jungle, only to discover that the vines winding through the corpses are not so benign. This Large miniature, released at the Uncommon rarity, features just such remains, certain to remind your players of just how deadly a threat they're facing when it plops down on the battle mat. While many would-be treasure seekers fall victim to murder vines and litter the jungle with their desiccated bones, not all prey of predatory plants are so lucky. Those who die at the tendrils of other mulchy menaces may be infected by their seeds and raised as fungal zombies! The culprit of such nefarious natural schemes is none other than the Musk Creeper, whose animated spawn not only serve as protectors of their parent vine, but act as seed carriers when they inevitably wander off into the jungle and die, creating a new plant to further torment future explorers. The Musk Creeper is a Medium Uncommon figure. Other plants, such as a particularly pernicious variety of reddish brown mold, create not zombies, but intelligent pygmy plant men whose primitive societies spread through the jungles of the world. These Mold Runts hold their progenitor corpse, from whose innards they spring, wholly formed after the subject dies from exposure to the mold, in almost religious reverence, and often craft crude weapons out of the bones or equipment found on their birthing corpse. While weak in small numbers, these diminutive plant people are truly a force to be reckoned with in large numbers. The Mold Runt is a Small Common figure, allowing GMs to easily collect multiple copies with which to overwhelm their players. 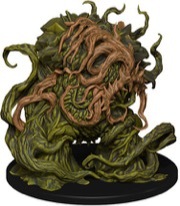 Finally, another iconic plant makes its Pathfinder Battles debut in Jungle of Despair: None other than the hulking Shambler, whose formless bulk strikes fear into any explorer with even a passing result on her Knowledge (Nature) skill check. Dangerous in its own right, a Shambler exposed to electricity�either from a poorly planned magical attack, a natural lightning storm, or a nearby nest of static-charged lizards�flies into a rampage, absorbing the energy into itself and making it all the harder to bring down. Appearing as little more than moldering heaps of rotting vegetation, Shamblers are especially deadly when they infiltrate mulch piles and refuse pits, catching unsuspecting victims in their constricting tendrils. 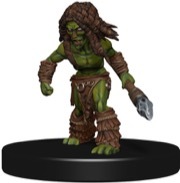 The Shambler is a Large Uncommon figure. But surely adventurers the likes and caliber of most Pathfinder player characters will defeat these threats handily, right? Reducing Shambler, Musk Creeper, and Murder Vine alike to little more than salad? Mmmm, salad. * How about next week we look at something that goes perfectly with any salad? I am, of course, referring to dressing!